Hailed as “a masterpiece” (Chris Evangelista, Slash Film) and “a mind-blowing experience” (Peter Travers, Rolling Stone), director Alex Garland’s (Ex Machina) Annihilation is coming to DVD and Blu-Ray combo pack. 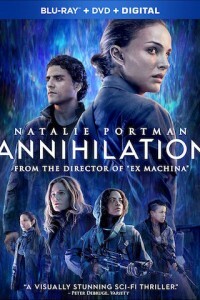 Biologist and former soldier Lena (Academy Award winner Natalie Portman) is shocked when her missing husband (Oscar Isaac) comes home near death from a top-secret mission into The Shimmer, a mysterious quarantine zone no one has ever returned from. Now, Lena and her elite team must enter a beautiful, deadly world of mutated landscapes and creatures, to discover how to stop the growing phenomenon that threatens all life on Earth. The film also stars Jennifer Jason Leigh, Gina Rodriguez, Tessa Thompson, and Tuva Novotny. –Refractions – See how director Alex Garland created the tone, textures and color palettes for the various film environments on set. –For Those That Follow – Listen to the cast’s perspective on their roles and learn why they found the story so intriguing. –Shimmer – See how filmmakers transformed real set locations to create the world of Annihilation. –Vanished into Havoc – Check out all the action as cast and crew walk you through the mind-blowing stunts and special effects. –Unfathomable Mind – Learn why the visual effects are integral to achieving director Alex Garland’s overall vision for Annihilation. –The Last Phase – Listen to the cast and crew share their fondest memories from filming Annihilation.